From tunnel scraps to celebratory trolling, Saracens and Glasgow have endured a tempestuous relationship these past few years. Saracens have won the lot - a team bursting with champions and Lions and Six Nations winners, fiendishly difficult to subdue. Glasgow yearn to get up there with them, to bridge the gap from Pro14 heavyweights to the pantheon of European titans. Warriors have only beaten Saracens once in 10 attempts since the dawn of pan-European competitions 24 years ago, and have never got the better of them south of the border. They contested two thunderously competitive and distinctly hot-tempered pool matches this season, both of them won by the English champions. They do battle again on Saturday with a place in the Champions Cup semi-finals at stake, but what is behind their feisty rivalry? Ryan Wilson is Scottish rugby's wind-up merchant supreme, a gloriously antagonistic back-row who can cut you down with his tongue just as effectively as his tackling. Wilson was at the heart of the now-infamous "scuffle in the tunnel", the handbags that preceded last year's Calcutta Cup match at Murrayfield. Footage suggests Wilson was imparting some wisdom to George Ford, when Owen Farrell steamed in to back up his pal, and there followed much grabbing of collars and gnashing of teeth. There have also been claims the Glasgow back-row, several sheets to the wind, booed whenever an English player appeared on screen at World Rugby's annual awards. It all made for a hilarious - if toe-curling - listen when Wilson joined England scrum-half Danny Care on the BBC Rugby Union Podcast to preview this year's Calcutta Cup epic. Behind the pained chuckling, gritted smiles, and forced use of the word "mate" somewhere in the region of a thousand times a sentence, there's a very tangible dislike smouldering away. Wilson missed the bonkers draw through injury but struck a pose clutching the trophy afterwards. Disappointingly, for fans of capers, Glasgow's injured co-captain will not be involved at Allianz Park. During the October pool match, Mathieu Raynal and his team of officials made a number of calls that incensed the Scotstoun crowd. Alex Lozowski was hauled into touch in the lead-up to Michael Rhodes' try. Rhodes grabbed DTH van der Merwe by the hair but wasn't shown a card. Several over-zealous clear-outs - the worst a game-ending bludgeoning of Fraser Brown - went unpunished. Maro Itoje wreaked merry hell at the breakdown. Glasgow coach Dave Rennie took these clips and more to the competition's head of referees, Joel Jutge. "I think Maro Itoje is a law unto himself, seems to get away with a fair bit," he said. "Maybe they're a bit more streetwise in instigating some of their stuff and we got punished for it." 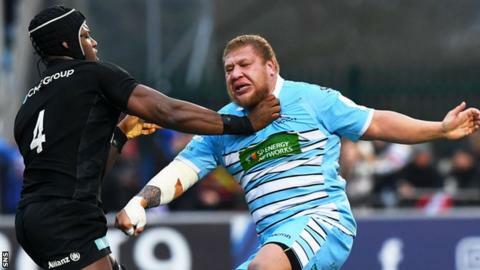 Scotstoun erupted when Van der Merwe blasted through half of the Saracens team en route to the whitewash in October, but Raynal had long since blown up for a Glasgow infringement. Joyous celebrations ensued - Van der Merwe and his mates hadn't heard the whistle. Itoje had. The Lion took great delight in sarcastically joining the ruckus, pumping his arms and hollering. Rugby doesn't really do this stuff - nor does it quite know how to react when it happens. A bit of harmless, amusing banter, or disrespect unbecoming of the sport? Opinion was split. Naturally, Glasgow were not impressed. "Humble bloke", tweeted scrum-half Ali Price in a post that was later deleted, while Wilson added: "They are probably one of the worst teams for mouthing off and celebrating in your face." Twelve Saracens and Warriors players made it on to the field for the most jaw-dropping, sense-scrambling Calcutta Cup Test earlier this month. Farrell will be seething at how he was charged-down for Scotland's first try and threw an interception pass for the fifth. Adam Hastings will in all likelihood be opposite him on Saturday, while Sam Johnson, scorer of the outrageous try that briefly nudged Scotland into the lead in London, will surely start. Stuart Hogg is back from injury. As is Itoje.